Workplace diversity fosters flexible thinking and innovation, be it through gender, racial, ethnic, or age diversity, according to McKinsey’s 2015 Diversity Matters report. The same applies when organizing a conference. Attracting a diverse line-up of speakers brings different perspectives, increasing value for the participants. It further encourages a dynamic, inclusive environment that can also increase the diversity of the event’s audience. How to find diverse speakers? A diverse, inclusive conference is not only a noble goal but a great differentiator for your event, too. Make the Code of Conduct visible on the event homepage, share it with the speakers. Give confidence to attendees that it is enforced. Increase trust by showing diversity from previous editions; pictures and testimonials are effective. Intentionally seek out and create relationships with diverse speakers. Reach out to connections in under-represented groups and ask for intros. Join online communities and follow events from other industries, with a focus on diversity and inclusion. Make your brand a household name in diverse circles. Share your mission through a carefully crafted CFP. I TAKE Unconference, for example, encourages and coaches practitioners with extensive subject matter expertise, but limited speaking experience. How to create a diverse program? Aiming for diversity becomes much more attainable when you have a representative program committee. Involve reviewers with different backgrounds and a wide range of skills and experiences. Assert the importance of diversity and inclusion to the organizing team and the program committee. Emphasize keeping implicit biases in check during the entire selection process. 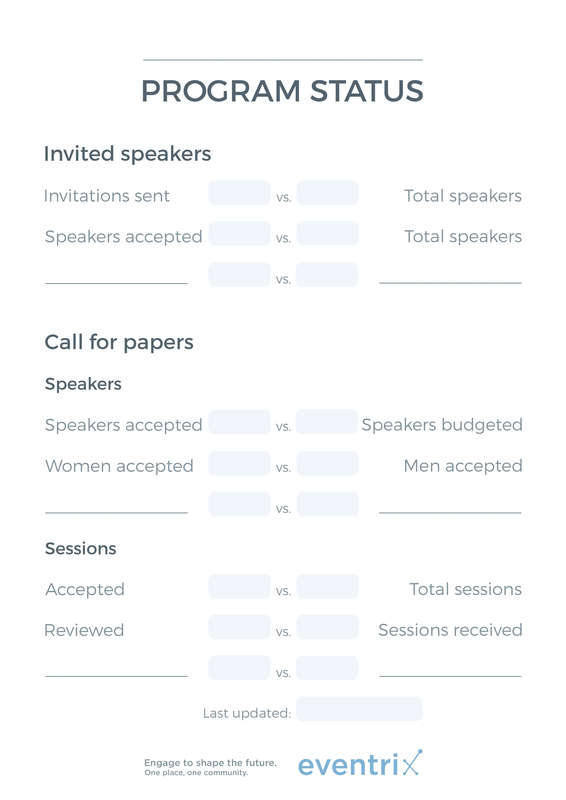 Since highly technical themed events attract predominantly analytically-minded speakers, you might want to balance that by seeking out and encouraging submissions from relevant creative types. Establish a target for the kind(s) of diversity you are looking for and keep count. To easily manage the proposals and review process, with diversity indicators in mind, you might find this Program Overview template useful. If you’re focusing on gender diversity, ask female speakers and participants if they are having fun, feel welcome and comfortable. Give them the opportunity to submit feedback anonymously. Feeling unwelcome makes people walk away or simply not come back for the next event. Solicited feedback can start a conversation about behaviors that can be avoided. Quality social interaction and innovation thrive in a positive, welcoming atmosphere. It is the task of event organizers to foster it. Make sure the conference is representative of the industry, as well as the community, by including diverse speakers. What are some great events you’ve attended that encourage diversity and inclusion? Let us know at @eventriXco on Twitter.